Bought from the artist by Sir Frederick Wigan, Bart. (+); Christie's, London, 9-10 December 1915, lot 116 (640 gns to Cremetti). with Eugene Cremetti, London, until 1915. 1st Viscount Leverhulme, and by bequest to The Lady Lever Art Gallery, Port Sunlight; Christie's, London, 6 June 1958, lot 93 (230 gns to Gooden & Fox). with Gooden & Fox, London. with Charles Jerdein, London, until 1963.
with James Graham & Sons, New York, until 1969 (exhibited in New York, 1964; Jacksonville, Florida, 1965; and Palm Beach, Florida, 1966). Allen Funt, New York; Sotheby's, Belgravia, 6 November 1973, lot 24.
with The Maas Gallery, London, until 1973, when purchased by the present owner. Times, 1 May 1890, p. 13. Athenaeum, no. 3262, 3 May 1890, p. 576. Illustrated London News, 3 May 1890, p. 547. Magazine of Art, 1890, p. 306. P.C. Standing, Sir Lawrence Alma-Tadema O.M., R.A., London, 1905, p. 68, illustrated. R. Dircks, 'The Later Works of Sir Lawrence Alma-Tadema, O.M., R.A., R.W.S. ', Christmas Art Annual, London, 1910, pp. 2, 31, illustrated. R.R. Tatlock, English Paintings of the 18th-20th Centuries: A Record of the Collection in the Lady Lever Art Gallery, Port Sunlight, formed by the First Viscount Leverhulme, London, 1928, p. 86, no. 2871. Art Quarterly, Detroit, Summer 1963, illustrated. Anonymous, Alma-Tadema, Rizzoli paperback, New York, 1977, pls. 31, 32. V.G. Swanson, The Biography and Catalogue Raisonné of the Paintings of Sir Lawrence Alma-Tadema, London, 1990, pp. 239-40, no. 335, illustrated p. 438. London, New Gallery, 1890, no. 53. London, Royal Academy, Exhibition of Works by the late Sir Lawrence Alma-Tadema, OM, RA, Winter 1913, no. 199. Liverpool, Walker Art Gallery, Autumn Jubilee Exhibition, 1922, no. 471. London, Art Exhibitions Bureau of Great Britain, 1955, no. 56. New York, Metropolitan Museum of Art, Victorians in Togas: Paintings by Sir Lawrence Alma-Tadema from the Collection of Allen Funt, 1973, no. 24, illustrated in catalogue. Rotterdam, Rotterdam Art Foundation, 1974. Leeuwarden, Het Princessehof, De Wereld van Alma Tadema, 1974, no. 34. This delectable little picture, one of the most attractive of Alma-Tadema's many garden scenes, was exhibited at the New Gallery in 1890. It was only two years since this venue had opened in Regent Street as a successor to the Grosvenor Gallery, launched in 1877 as a liberal alternative to the Royal Academy and showcase for the more innovative trends in modern British art, but generally perceived by 1888 as having fallen short of its original ideals. In a Rose Garden was accompanied by Eloquent Silence, a picture now missing but known from an old reproduction. 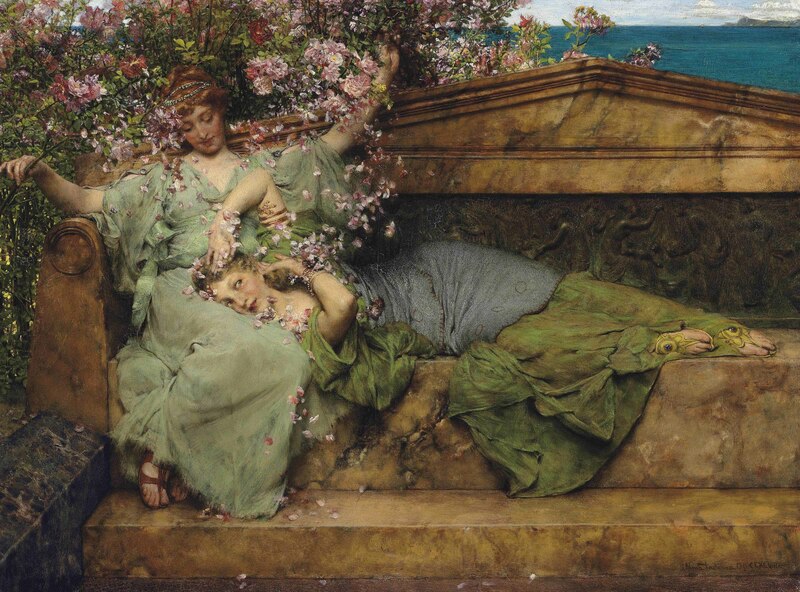 In many respects the two works were comparable, Eloquent Silence also showing two figures seated on one of Alma-Tadema's trademark marble benches, with a large clematis taking the place of the rose bush behind. There was a little more narrative content in that the girl was clearly wishing her lover would come to the boil and propose, but the pictures had enough in common for reviewers to refer to them as 'pendants' and discuss them together. There was some debate as to whether the artist had set his subjects in the Graeco-Roman period or the late Roman Empire, while the Times took him to task for cruelty to roses. 'To us', its critic wrote severely, 'roses are better on their stalks than when shaken to pieces in the air'. Everyone agreed, however, that technically the two pictures could not be faulted. The Art Journal admired their 'masterly execution', while the Illustrated London News thought each 'a gem in its way,...marvels of skilful workmanship in the style in which Mr Alma-Tadema excels'. F.G. Stephens, the former Pre-Raphaelite Brother who had already been art critic on the Athenaeum for nearly thirty years and still had another eleven to go, was perhaps the most enthusiastic of all, arguing that the two pictures, 'although small in scale and comprising only two figures each', represented 'the most beautiful, if not the most ambitious, phase' of Alma-Tadema's art. Having given a long description of In a Rose Garden, he concluded: 'The beauty of the faces of the damsels, their spirited and spontaneous expressions, the vivacity of their attitudes, not less than the charms of the colouration and illumination of this picture, which are singularly brilliant and vivid, make [this] even more attractive than most Tademas'. The picture has a long and distinguished provenance, some links in the chain calling for particular mention. In 1915 it was bought by Viscount Leverhulme, the soap magnate who founded the Lady Lever Art Gallery at Port Sunlight, and it remained there until many of the Gallery's pictures were sold at Christie's in June 1958. The sale was ill-advised in that it took place at the very moment when Victorian pictures, so long out of fashion, were returning to favour, but two subsequent owners epitomised the more enlightened age that was now dawning. By the early 1960s the picture belonged to the London art dealer Charles Jerdein, who pioneered the revived Alma-Tadema market; and a decade later it was acquired by Allen Funt, the American television personality who created and hosted the popular and long-running show Candid Camera. Funt's collection of Alma-Tadema's works, though prematurely dispersed at Sotheby's Belgravia in 1973, was formed with such conviction and enthusiasm that his name will always be associated with the painter, whose own connections with show-business, whether as a friend of distinguished musicians or a precursor of Hollywood, were far from negligible. The title of the exhibition when Funt's Alma-Tademas were shown at the Metropolitan Museum, New York, in the spring of 1973 - Victorians in Togas - has likewise acquired legendary status, summing up so perfectly the ethos of the artist's work.